North Star extended above Quantum of the Seas. 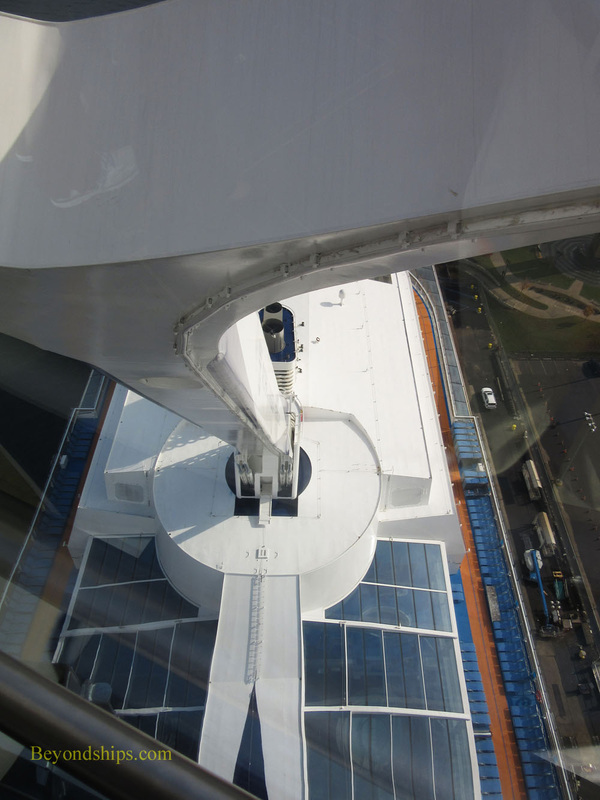 The North Star is the signature feature of Quantum of the Seas. 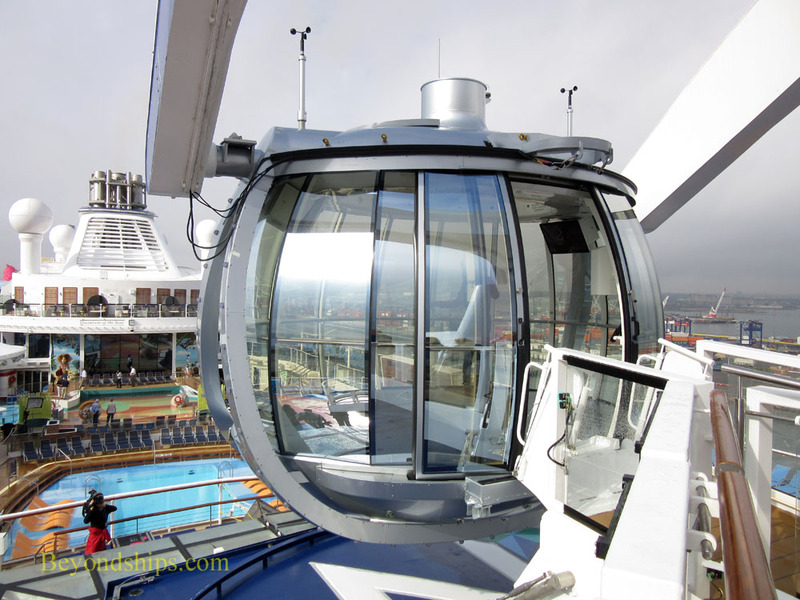 It is a glass-enclosed capsule attached to a mechanical arm that is attached to Quantum's top deck. The arm can raise the capsule some 300 feet above sea level and turn 360 degrees. 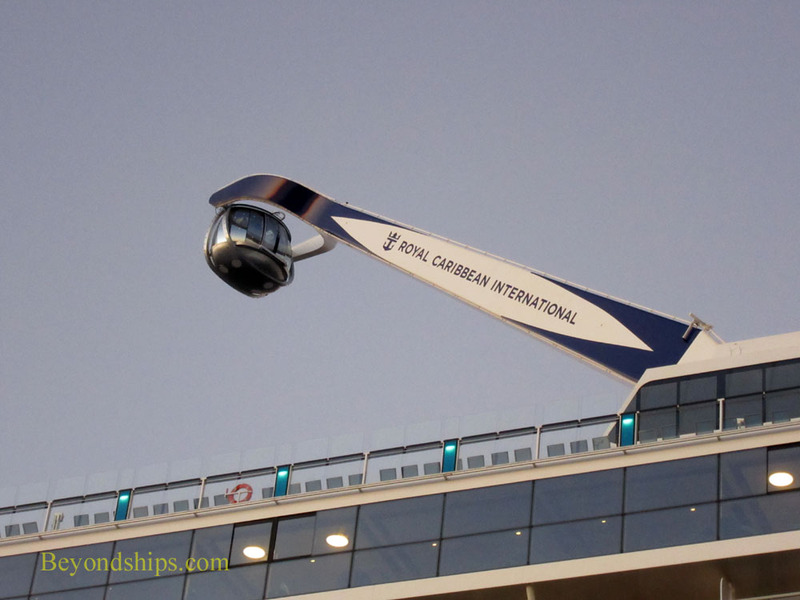 According to Royal Caribbean Cruises Ltd's Chairman Richard Fain, the inspiration for North Star was the London Eye. That great Ferris wheel-like construction lifts visitors above the landmarks of London, allowing them to see the city as a totality. Similarly, the idea for North Star is to allow guests to see the ship, the sea and the ports in perspective. Although North Star has no nautical function on Quantum of the Seas, it does have maritime precedents. Sailors have long looked for ways to see beyond their own ship so as to understand how it fits into the world around it. In the days of the sailing ships, sailors climbed to the top of the masts in order to get a better view of what was around the ship. This practice continued into the heyday of the great liners where sailors would be stationed as lookouts high up in the vestigial masts. Along the same lines, early battleships had viewing stations high above the rest of the ship so that the officers could find targets, develop firing solutions for the ship's big guns and track the fall of shells. 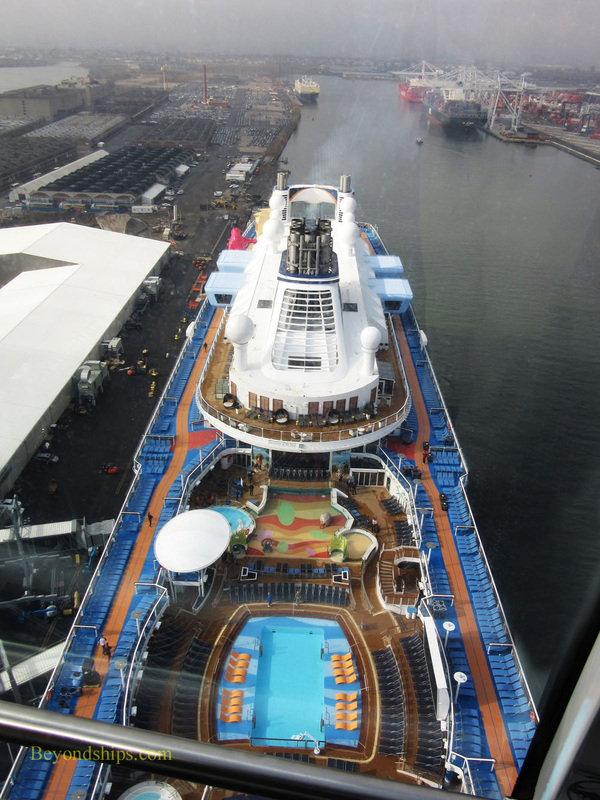 Today's guests do not have to climb rigging or perilous ladders to get a panoramic view. 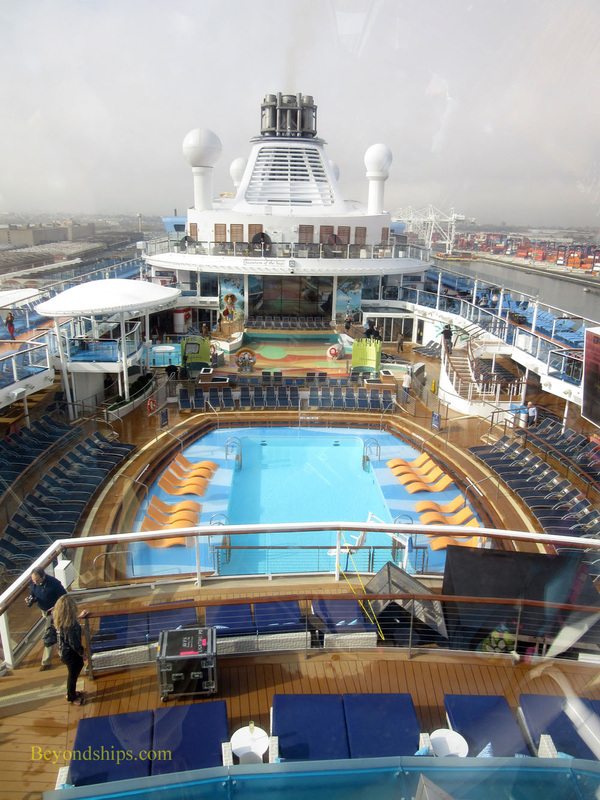 Instead, you just take an outdoor staircase from Deck 15 to North Star's landing station on Deck 16 just forward of the Outdoor Pool area. The North Star capsule has a capacity of 14 guests. When I went aboard, there were about half that number. There are no seats in the capsule. This allows the guests to move about and take in the view in all directions. Before take off, several of the guests commented that they did not like heights and while they did not say anything, a few more looked somewhat apprehensive about this journey. I had to nod in agreement. However, all thought of making a run for it ended when the heavy door closed with a quiet thud not unlike the sound made by the door of an airplane. The capsule took off smoothly. In fact, I did not really notice that it was moving until someone mentioned it. The feeling was more like the rest of the world were somehow sinking downwards while we were motionless. Since the capsule has floor to ceiling glass in all directions, you would think that you would feel somewhat exposed. However, I had no problem standing by the front panels, looking down at the Outdoor Pool area below. It was like going up in a glass elevator. North Star reached the apex of its climb very quickly. The deck below seemed much further away than I had anticipated it would when I was watching North Star beforehand. A sign before we boarded had described the view from the top as being like the view from a helicopter and indeed, it did look like the view from a low-flying aircraft. There had been a fog that morning and although it had mostly burned off, the view of New York City off to starboard was still obscured by haze. Nonetheless, it was a thrilling view looking over the harbor and the New Jersey countryside. All of the guests were talking and moving around the capsule. The looks of apprehension had disappeared. People were laughing and taking photos of each other or of the view outside. I spoke with the operator about whether North Star had operated when the ship was at sea. He said that it had. North Star was built to withstand high winds like those that can be encountered even on a clear day at sea. However, if the ship is rolling significantly, North Star does not operate. This made sense because the higher you go on a ship, the more you will feel the roll. It is like a pendulum, the top of the arm travels a lot further than the base. A trip in North Star is supposed to last 15 minutes. However, it seemed like we were descending just after we took off. Looking back at it, I think we had our full allotted time because too much happened for it to have been any less time. North Star is complimentary. However, it can also be hired for weddings, proposals of marriage and other special occasions. Above: North Star on the rise. Below: The landing where guests board the capsule. Above: The view from the capsule before take off. Below: The view near the apex of the ride. Above: Looking down North Star's arm.